Take a moment to imagine Fox’s Mental Samurai, a new game show hosted by Rob Lowe in which contestants are hurtled around in a metal basket attached to a giant robot arm and then forced to answer trivia questions. Whatever you have in your head, I promise you, the reality is sillier than that. The giant robot arm is named Ava, and although host Rob Lowe says things like, “Meet Ava,” as though we’re all being introduced to a giant robotic personality, it’s just a huge robot arm thing with a bucket on the end. Contestants are strapped inside of the bucket, and then Ava propels them high and low to various towers called the Towers of Samurai. The contestants have five minutes to answer questions from each one: the Tower of Memory, the Tower of Sequence, the Tower of Puzzles, and the Tower of Knowledge. There is no Tower of How Any of This Relates to a Military Nobility Class of Medieval and Early-Modern Japan. 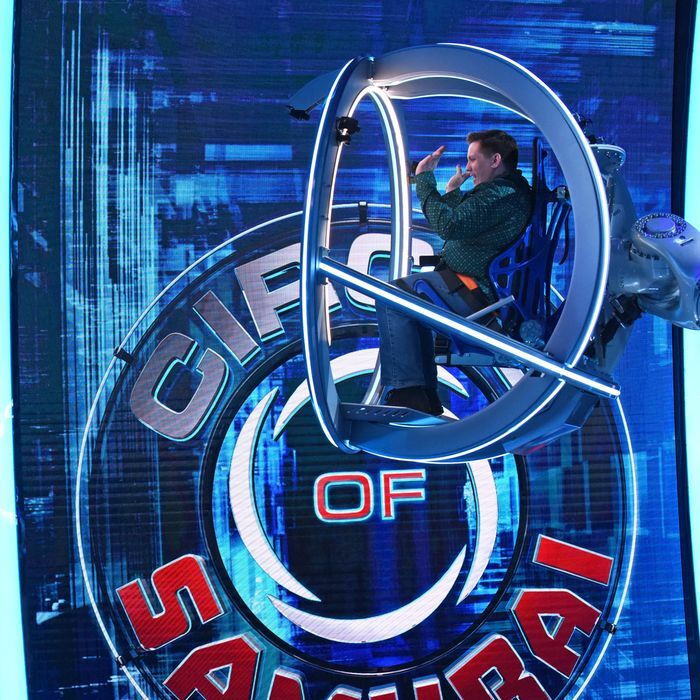 If contestants manage to successfully answer the questions of all four towers, they proceed to the Circle of Samurai, where they are still strapped in a robot bucket and given even more trivia to answer. I was hoping there’d be some additional level of complication at this point — perhaps a trickier system of stakes and risk, or the introduction of a team element? But the Circle of Samurai is just the Towers of Samurai again, only shorter. Mental Samurai is not the first game show to combine trivia challenges with physical ones, of course. The strangest and most cerebral version was the 2002 ABC series The Chair, hosted by John McEnroe, where contestants had their heart rates monitored while answering questions. If a contestant’s heart rate peaked above a designated limit (based on each contestant’s resting heart rate), not only did they start losing the money they’d won so far, but they couldn’t answer the question until their heart rate was back below the line. Right now, NBC has Ellen’s Game of Games, a mashup of physical and mental challenges that’s either chaotic, silly good fun, or Ellen DeGeneres torturing ordinary people for her own amusement, depending on how you want to look at it. Both of those shows are more complex than Mental Samurai, a game that often asks contestants to put things in alphabetical order, to watch a short video clip and then describe something about it, or to list landmarks from west to east. The physical challenge aspect doesn’t even seem that overwhelming. Although Fox’s website insists that Ava is “capable of rotating 360 degrees,” contestants are never turned upside down or actually sent spinning in any dramatic, nausea-inducing way. (The 360 degrees referred to may be … a flat circle?) And while I don’t doubt it’s unnerving to sit in a metal basket while Rob Lowe grins at you from a nearby balcony and says, “I’m not a lawyer — I just play one on TV,” nothing about Mental Samurai feels fresh or notable. At least Lowe makes for a strong game show host, full of enthusiasm and delight and empathetic sadness when appropriate. The phrase “childlike joy” comes to mind. His face is also elastic enough to make for impressive reaction shots, and when he talks about his own excitement and anxiety, you believe him. Plus, that lawyer joke is basically a wink to The Grinder, which has to count for a something. But Mental Samurai never elevates itself above “people sit in a moving robot arm thingy and answer questions,” and no matter how hard I tried, I could not seem to work up the same level of emotional investment Lowe so wholeheartedly evinces. (Although I did enjoy the episode with a contestant named Sam, who does drag in his spare time.) It saddens me to report that a show featuring Rob Lowe, a giant robot arm, and an off-duty drag queen is somehow not must-watch television, but it is indeed not.